This pattern is available for FREE on my blog HERE. The downloadable PDF listed for sale contains the full pattern (including pattern notes, stitch guide, written instructions and links to the video tutorials), in one printable file without advertisements. This design is a set of three mandala’s called Trinity Mandalas. You can make one size several times, or make all three sizes. 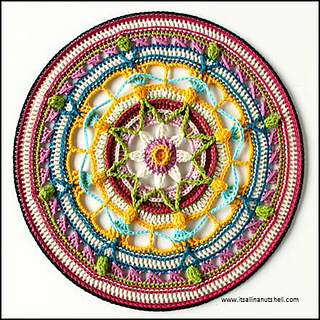 You will need 10 colors of Scheepjes Catona (50g/125m) yarn and 3 mandala rings to make the Trinity Mandalas. You will also need 3 rings to finish the mandalas. You will need rings with diameter 50cm (20″), 30cm (12″) and 15cm (6″). 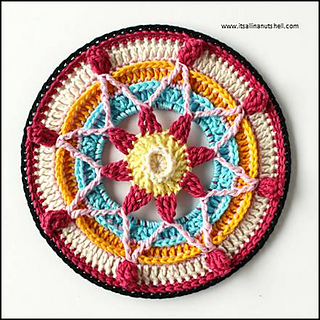 We make the mandalas using a 3mm crochet hook. 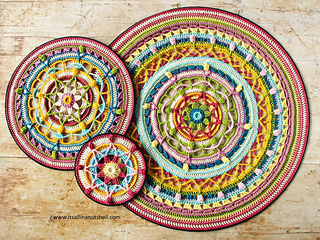 The finished mandalas are 50cm (20″), 30cm (12″) and 15cm (6″) in diameter. 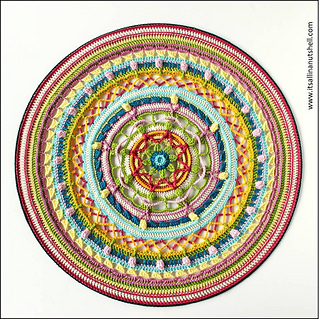 The metal rings help to stabilize the mandala’s and make it possible to hang them on a wall. 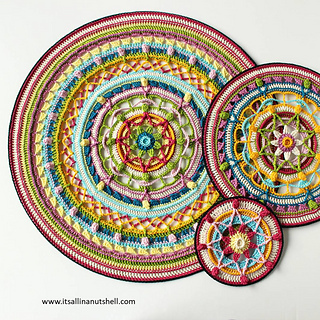 The pattern for Trinity Mandalas is divided into 3 parts; in part 1 you make the small mandala, in part 2 you grow the small mandala to become the medium mandala, and in part 3 you grow the medium mandala to become the large mandala. The written patterns are available in English US Terms, English UK Terms, Dutch, and Swedish. The video tutorials are available in English US Terms. On my blog there are links to the 3 parts that make up the pattern. The 3 individual parts are available for free on my blog. Here on Ravelry, you can purchase a single, PDF file which contains all parts of the pattern in one file, as well as the links to the video tutorials. Finished items may be sold, I just ask that you give credit to me, Esther Dijkstra from It’s all in a Nutshell for the pattern. These patterns have been tested, but a mistake could still slip through. If you believe there is an error in the pattern, please let me know and I will address the issue. I hope you love these mandalas as much as I do.